TeachEm is a free and user friendly digital tool that allows users to capture YouTube content, organize it, and add time stamped flashcards to guide the learning. It’s simple, smart and efficient which makes it a good tool for busy teachers interested in implementing a Flipped Classroom instructional model. Teachers can sign up for a free account with an email address and create a school. The school is not meant to be the school that employs you, it is supposed to be “The School of You”. Once you’ve created your school, you can create classes of organized YouTube videos fairly easily. 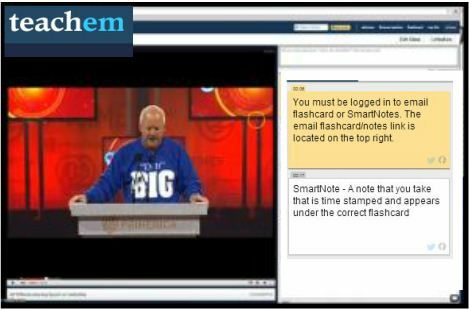 The set of Flashcards and SmartNotes can be emailed as live links which open to specific parts of the videos when clicked. Although I didn’t find any features for embedding a class, you could copy and paste the set of live links into your own online learning platform or website for quick and easy student access.